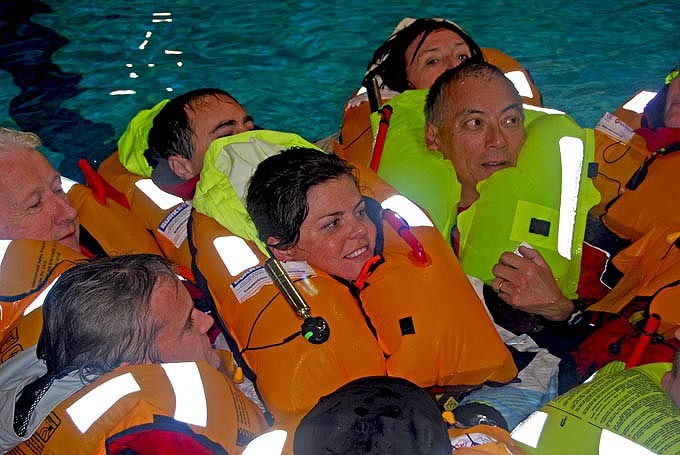 The ever popular and always sold out ORCV Sea Safety and Survival Course has begun, yet again. The February course was designed to help those on the wait list and also ensure that Skippers wanting to head to King Island next month, could have the greatest number of SSSC qualified souls onboard. These pictures were taken by The Brass, as the Saturday February 26 morning session of the whole weekend course began at Melbourne High School's gym and pool. The new, small class size courses have been running since late last year, since being mandated by YA. ORCV Rear Commodore and YA Offshore Instructor, Neville 'Nifty' Rose presenting to the class. Nifty is also the Chairman of Training Committee. "We're always keen to do whatever we can to assist our members and increase participation levels, so we slotted in a Feb SSSC", said Nifty. Speaking of participation; 26 boats are off to King Island, thus far. The latest entry was Kevin Robinson and No Fearr. As Nifty presents, former ORCV Commodore, Noel May, does his best 'The Price is Right' model trick and displays the props to the class. There are a number of boats that go to sea with their crew all SSSC qualified souls, which is plainly very smart. You can bolster the number of SSSC qualified souls for your racing this season and next Xmas by doing the new, small group of our famous Sea Safety and Survival Course. With Melbourne to King Island just around the corner (12/3/11), this is also very timely indeed. The first positions have already been taken by those on the waiting list and the new small group format will obviously fill even faster than the old large class, so if you would like to participate, then jump right in. MUST get a completed and paid for enrollment to the office by Feb 18!!!!!!!! which is linked off the bottom of the said course outline. Click HERE to start. In relation to qualifying passages for the Heemskirk Consolidated Eastcoaster and Westcoaster, The Brass says, "A boat shall substantially complete a qualifying race of not less than 150 nautical miles, not more than twelve months before the start of the race. If you cannot complete a race, you can complete an offshore passage of 150 miles and submit a log of the passage." Please call the Chairman of the Sailing Committee, Simon Dryden on 0418 145 909, if you have any questions. Heemskirk Consolidated MD, Kevin Robinson, in front of the Heemskirk Consolidated Westcoaster and Eastcoaster banner. Seminar is at RBYC on 11/11/10. At any rate, have a read - they're short - and be advised. Click HERE to get them, now. Lots of PFDs inflated here (during the SSSC). Jordan Crowley from the new HCOTW, Gienah, is front and centre.